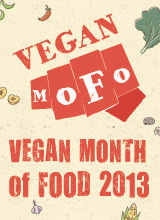 Day 15 of vegan mofo, and I am hoping this post will make some vegans out there VERY happy…. making the croissanty dough for these is a bit of a labour of love, it takes over a day, but some things are worth the effort. I recommend two things for this to make it not a waste of time, good choc chips and a good tasting vegan marge. in a bowl mix together the almond milk, water, yeast and sugar. Set aside until active and frothy. Add the flour, followed by the salt, and stir to partially combine. Add the cup of margarine in little blobs and carefully incorperate-trying not to mush too much as you want ther to be little lumps throughout the dough- lightly knead the dough on a floured surface to form a ball and place in a bowl and cover with cling film before transferring the dough to the fridge for about 2 hours. Roll out on a floured surface into a rectangle about 1/4 inch thick, blob extra margarine into the centre, fold the dough like a letter into thirds, roll out into a rectangle again. Refrigerate for another couple of hours and turn the dough round repeat the same method again, and roll it out into a rectangle again. Repeat this one more time before chilling over night. Roll the dough out to 1/8 inch thick and slice into even little rectangles. 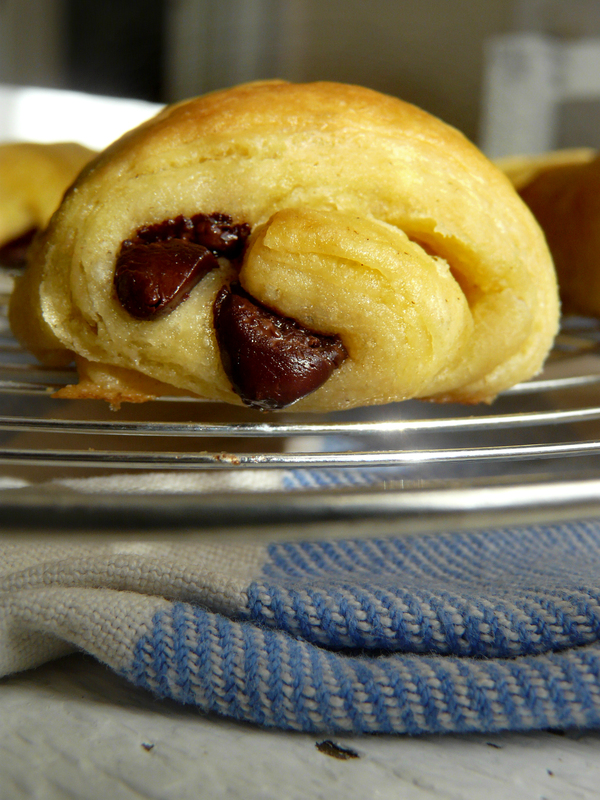 Add a roll of chocolate chips and Roll up starting on the shortest side and going towards the tip just enough to cover the chocolate chips. Then add another line of chocolate chips and roll all the way up and transfer to baking sheets lined with baking parchment and allow to rise for 1 hour- 2 hours before glazing with melted vegan margarine and baking at 200c/425f in a well preheated oven. This entry was posted in Breads, breakfast, sweet treats, VeganMoFo 2013 and tagged baked, baking, bread, chocolate, dairy free, egg-free, food, recipe, vegan, vegan month of food, veganmofo. Bookmark the permalink. I looove pain au chocolat! These look stunning! Mmmmm, now there’s a recipe I need to attempt. 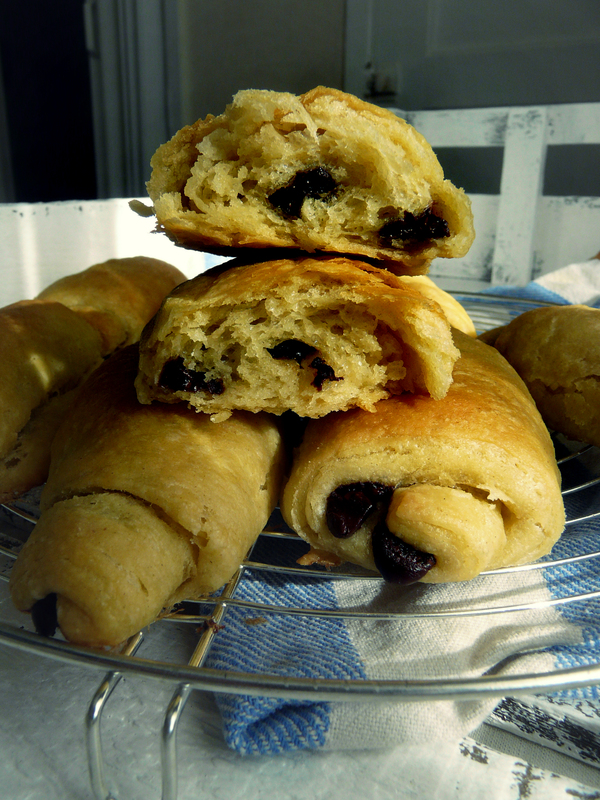 I’ve made Danishes but I still need to try pain au chocolat, plus, chocolate! One of my favorite pre vegan treats. Excited to try this.